send their applications to HCL Khetri Copper Complex, Rajasthan to be reachable on or before 30-03-2019. 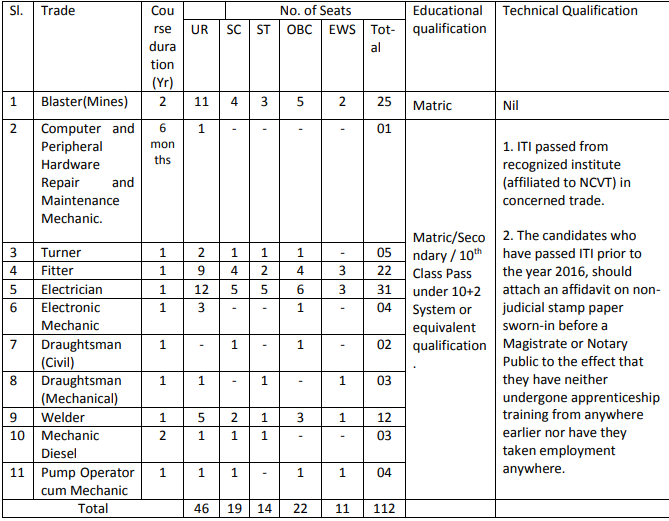 There are total 112 trade apprentices of Fitter, Electrician, Welder, Machinist and Turner vacancies available in different trades of HCL KCC Recruitment 2019. Selection for this recruitment of HCL Trade Apprentices will be held based on a merit in ITI and 10th marks. For more information regarding this recruitment of Hindustan Copper Limited Trade Apprenticeship Program see the details elaborated below. Click here to see the official notification of HCL KCC Trade Apprentice Recruitment. There are total 112 trade apprentices vacancies available in KCC. Trade wise vacancies are given below. For category wise vacancies please see the official notification. Age limit as per the norms Apprenticeship Act. Age limits cut off date is 30-03-2019 and age limits for General candidates is 18-25 years. For reserved category candidates age limits are applicable as per the jharkhand state govt norms. Matriculation with respective ITI trade with 2 years from NCVT approved institute or board. Candidates have to submit the affidavit on non judicial stamp paper sworn in before a magistrate or Notary Public while saying that they are not taken an apprenticeship program before. 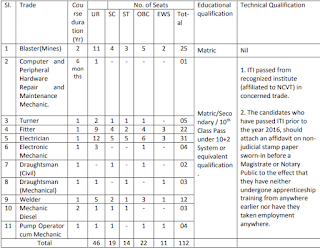 Selection for this recruitment of HCL KCC will be held based on ITI marks and 10th class marks percentage..
Training for Blaster (Mines) will be given for 2 years and for Mate(Mines) 3 years. For all other trades training will be one year only. Stipend also paid during the training period as per admissible rules of HCL. Eligible candidates has to submit their application form in a prescribed format which available in official advertisement of HCL KCC along with all required documents. Candidates can submit the application in person or through speed post/registered post while mentioning on cover letter "Application for Trade Apprentice for Trade----------------------". Click here to download the application form and Notification….